My religious beliefs are part of who I am, so they influence everything I do. But I wasn’t setting out to write a religious story. I wanted to write a good one. Of course, what I think is good is informed by my beliefs. I see patterns—triumph through sacrifice, death and resurrection, small foolish things overthrowing powerful things—everywhere in the world, in history, in literature, in mythology. And I find those patterns beautiful and work to imitate them. I also see the world crawling with mystery, every corner crammed with life and the secrets that sustain it. That is certainly something I try to communicate. American kids have plenty of fantasy that appeals to them. The question is only how they feel about their own lives and environments when they’ve finished reading. On my last book tour, I ran a little experiment. I would ask groups of kids which country they needed to live in if they wanted to have magical adventures. Of course, fantasy and magic are global. They can wander anywhere. But that’s not what I was told. The answer (always shouted back), was England. I love English fantasy, and that nation (in my own humble o.) has produced the best fantasy to date (a few times over). But I wanted magical imaginations to broaden, to more thoroughly include the taste of Americana mythic. I want kids to look at lonely red barns in the same way that I would have looked at a wardrobe discovered in an empty room. I want the whole world to be seen as magical, including our part of it. And so I use baseball and wheat fields and a tiny rural town in Kansas. Thanks to Oz, we know anything can happen in Kansas. As a reader of fantasy with an unabashed love of all things British, Wilson's observation stunned me into admitting that there is absolutely no good reason why kids should think they need to live in England to have a magical adventure. There is so much wonderful fantasy that begins and ends in America and the 100 Cupboards trilogy will go a long way towards convincing kids (and adults) of that. In the interview, Wilson also goes into some of the sausage-making details about the worlds behind the cupboards, saying that they are not separate worlds, but a "branch on the same tree, a twig on the same tumbleweed. Move down to the trunk, and it is all only one single world. Move up, and history forks and splinters into different branches of reality." My favorite response, though, was a question as to how all of the magic behind the cupboards works. Maybe I should keep mum, but I’ll give you a little something here. There are a couple types of magic in the trilogy. The most basic breakdown is between natural and unnatural. An example of natural would be the magic of the faeren. They are able to do what they are able to do in the same way that a bird is able to fly. The wizards (for the most part) are using unnatural magic. They are like men in helicopters—they have to manipulate and force the world to give them its strength. (Not that I have anything against helicopters.) The seventh sons are men with natural magic like the faeren—the world gifts them with different strengths and allows them a measure of control. Darius and Nimiane are blends, but I’ll say no more about them. The doors... now we must apply this to the doors. The faeren have their own “natural” fluctuating connections between distant places which they can control. The forgotten wizards set themselves “unnatural” gashes in reality, and fixed them in place with stone. The cupboard doors are primarily natural connections—but they have been collected and arranged and manipulated in an “unnatural” and dangerous way. Of course, I would be thrilled if the world were to improve thanks to my labors. But I think of myself as a cook (a chef on my fancier days). I want to feed as many young imaginations as I can. I want to feed them well. I want them healthy. I can hope that my readers will be improved and go on to improve the world around them. But more immediately, I can hope that I have given them friends and siblings and cousins in my characters. I can hope that I am brightening days and weeks and dreams. I think that that is such a wonderful answer and such a grand measure for the value of a book. As a mother, bookseller and reviewer, I am always thinking about the value of a book and weighing the various factors involved in getting a child to read and keeping him/her reading - or, in many cases, helping the voracious reader to choose with a purpose. Every book read doesn't have to be about being entertained and it's not always reading for reading's sake and getting that practice under the belt. I agree whole heartedly with Wilson. When I help a child choose a book, I, too, want to feed their imaginations and feed them well. We want them healthy and not littered and clogged with throw-away books. And, most of all, I hope that they will find "friends and siblings and cousins" in the characters of the books they read. Of course a little candy is okay now and then, but really, there is so much good literature out there, for children and adults, why not read with a purpose beyond just being entertained? 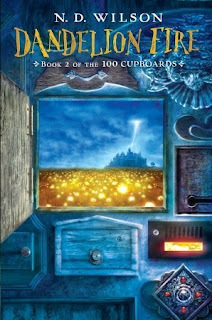 In the 100 Cupboards, as a reader, I felt a bit like Henry, stumbling along as his adventure unfolded around him, mostly unaware of how any of it worked or what he needed to do to fit in to and fix it. With Dandelion Fire, which does not feel like a second in a trilogy AT ALL, all things are explained - mostly - and Henry begins to find his place in the world, although which world still remains to be seen. When the book opens, Henrietta (the reason that the evil witch, Nimiane, has been freed from her prison and is after Henry) has hidden the key to Grandfather's room, making travel through the cupboards impossible for humans. However, Henry and Henrietta are soon out behind the barn digging for the buried key. As a storm approaches Henry has a life-altering physical experience that sets in motion a sort of adolescent transformation and a revelation. I feel like I want to keep mum about what happens in the book - it moves at such a breakneck pace and is so dense with sights, sounds, smells and touches that I strongly encourage you to read it for yourself. Wilson has masterfully crafted a complex fantasy with a world as rich as Narnia and every bit as menacing and dangerous as Middle Earth. And, the characters who inhabit this world, from Fat Frank the faerie and the mysterious Caleb with his dog the size of a pony to the more subdued and possibly even remorseful Henrietta and her father, the humanly flawed Frank, are every bit as complicated and absorbing as the geography they inhabit - be it magical or mundane. For a detailed rundown of Dandelion Fire, check out the review at Mugglenet, which was also written by Robbie F, to whom I owe a huge debt of thanks for his superb interview with Wilson that could only have come from his expansive understanding of the text. 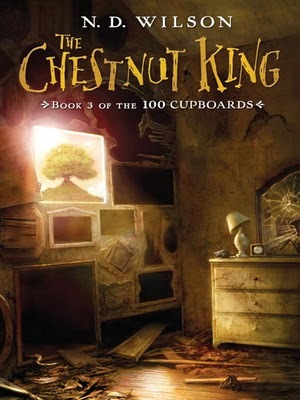 Don't miss the final book in the trilogy, The Chestnut King.